The non-seasonal adjusted data showed industrial production increasing by 8.2% year-on-year in 2017 versus 1.7% in 2016. In seasonally-adjusted terms, IP jumped 9.2% YoY in 2017 (versus 0.7% YoY advance in 2016) thanks to export orders and expected production. 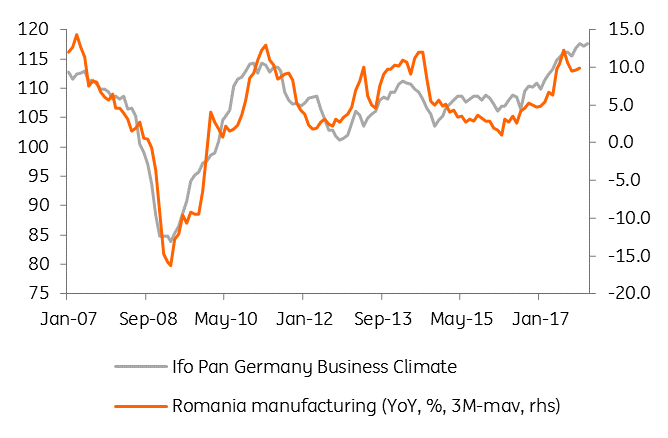 Despite a somewhat weaker expectation component, external demand for Romanian industrial goods appears to be strong in the short-term judging by the composite Ifo index for Germany, which rebounded to all-time high in January. Hence, the robust performance is likely to persist into 2018. Labour market constraints, which are forcing a general push into automation, could also boost productivity. The strong performance of the sector was due to the manufacturing segment, which posted a 16.5% advance in December 2017, and 9.9% for the whole year. 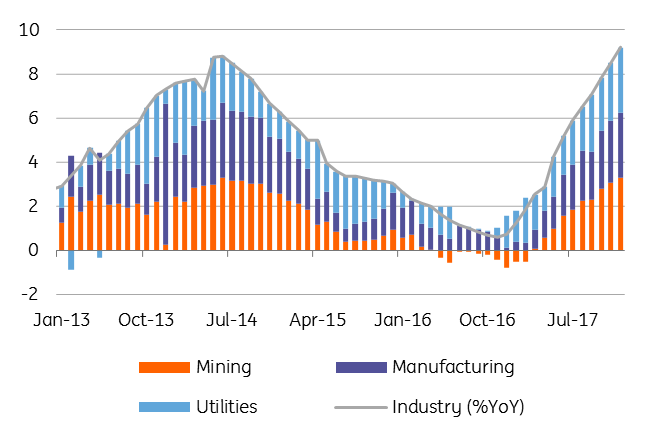 Mining and utilities expanded in 2017 by 5.5% and 1.5% respectively, versus the previous year. Good prospects for the industry sector bode well for our above-consensus 2018 GDP growth forecast of 4.7% versus the 4.1% Bloomberg median.